It is not often that a statuesquely beautiful lead soprano at an Ulster Orchestra concert is greeted by wolf whistles as she takes the stage for the second half. But that is what happened to Hannah Waddingham in a packed Waterfront on Saturday. She responded with a good-humoured acceptance of the compliments, and continued with a most accomplished performance in this special concert of I Love The Musicals. Although there was little background provided about the origins of the featured numbers, the slick pacing between the orchestral versions and featured soloists worked well. Ms Waddingham enjoys a stellar career as a soprano and as an actress known to millions as Game Of Thrones' Septa Unella. She captivated the audience with a wide range of hits, from Chicago to Leonard Bernstein's ageless West Side Story and much else. Her co-star, the Australian tenor Damien Humbley, was also impressive in several challenging performances, including a suitably jaunty Singin' In The Rain and Andrew Lloyd Webber's haunting Music Of The Night. 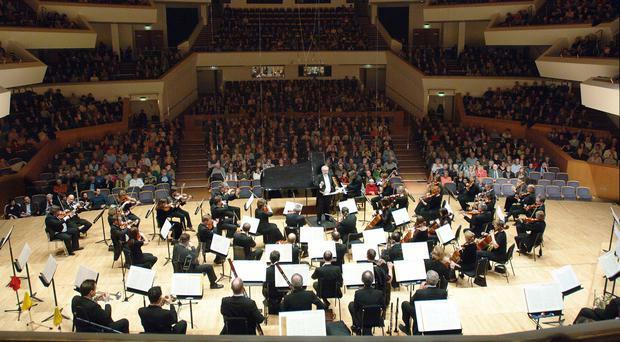 An added bonus in this superb evening of entertainment was the 100-strong Belfast Philharmonic Choir, and of course the augmented Ulster Orchestra, which so loves "All That Jazz" when away from the strictly classical discipline. It was all held together expertly by experienced musical director Robert Ziegler. The Ulster Orchestra's adventures into music from stage, screen and the charts world always attract huge audiences, and it is almost certain that its tribute to pop legends Abba in the Waterfront on April 21 will be another sell-out. Best to grab a ticket while you can.